Home Editor's choice The Titanic Ukraine Junta Is Sinking Fast, The Russian Iceberg Of Crimea And Donbass Has Done It’s Job ! 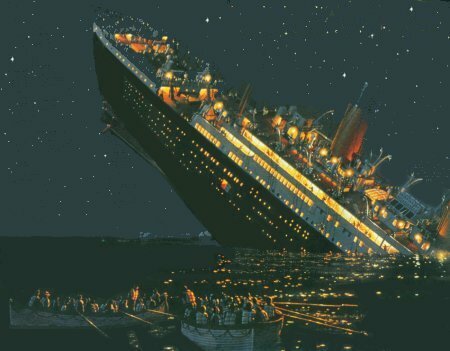 The Titanic Ukraine Junta Is Sinking Fast, The Russian Iceberg Of Crimea And Donbass Has Done It’s Job ! We can stop worrying for the future of the former Ukraine and Ukrainians: the Titanic of the Ukrainian statehood is already sinking. The hole by the Russian Iceberg in the form of the unconquered Crimea and Donbass has already done its job, and this hole in the stern of this failed east European “dream liner” can no longer be mended. Poroshenko and Co. do not understand that it is not them who are dictating a new political reality in Ukraine, but those people who have proved their right to violence in the streets. The country in which armed uniformed people enter into the parliament of the country and tell there stories about their fighting against a MP, can not call itself an existing state. Today they have fought against one MP, tomorrow they will fight against ten, and the day after tomorrow, when they are convinced that ‘they are all alike’, they will fight against the entire parliament. That is the question of when the Ukrainian sailor Zheleznyak is tired of waiting, is just a matter of time. Just several months, apparently. Observing the events of recent days in Ukraine shows that history has taught nothing to the political class of this former country. Poroshenko and Co. continue to make one decision after another – first, that the blockade of Donbass should be stopped, then that it must be legislatively resolved, while not seeing that they are more and more immersed in momentary problems which have no practical refraction on the scale of historical breathing of such a large country, since the main character of this tragic comedy with the blocking Donbass is no longer the office power in Kiev, but people in the streets. Ukraine has driven itself into zugzwang. Today, it can neither abandon Donbass, nor include it in its composition. The latter is impossible because it is impossible to unite the unconnected and so abundantly soaked in the blood of the civil war, in the absence of historical traditions of the statehood and elites corresponding to their own statehood. It is impossible to unite in one state mechanism Lvov and Kiev Banderites and the heirs of the Red Army in Donetsk and Lugansk. To cut Donbass off? It is also impossible to cut it off for very simple reasons. First, as soon as Ukraine leaves Donbass be, establishes a full-fledged border and stop shelling residential areas in the cities of Novorossia, within a maximum of a year Donbass will restore the peaceful life on the controlled territories and, in two to three years, will surpass the Ukrainian standard of living several times at an increasing rate. Ukraine and Europe have been playing with the prolonging the Minsk process for far too long, therefore, as a result, there will be neither the Minsk process, nor Donbass as a part of Ukraine. The fact that Russia has finally put an end to the Minsk process is evidenced by the creation of the public Integration Committee Russia-Donbass” which included representatives of the authorities of Russia, Novorossia, politicians, businessmen, experts and public figures. The Integration Committee Russia-Donbass” is created as a permanent public structure whose activities will be aimed at strengthening the process of humanitarian, social and cultural integration of Donbass and the Russian Federation. Until the end of 2017, several meetings of the Integration Committee are expected in Donbass and in the Russian Federation, within the framework of which it is possible to discuss topical economic, social and humanitarian issues of interaction between the Russian Federation and Donbass. In fact, the creation of this committee means that the public forces of Russia and Donbass are beginning to discuss and formulate the concept of integration of the LDPR and Russia, which then will naturally become the basis for integration of those other regions of Ukraine that will decide to join Russia. Secondly, the LDPR’s departure will immediately launch similar processes of decentralization in other regions of the country, first of all, in the Kharkov, Nikolaev and Dnepropetrovsk regions, as well as in Transcarpathia. The departure of Mariupol will mark the potential retreat of the Ukrainian territory practically up to Odessa, that is, Ukraine will almost lose access to the sea. This process is already being prepared at full speed by the local elite. In particular, according to the ‘News of Transcarpathia’, ‘Residents of our region who have Hungarian citizenship assure that, in case of aggravation of the political and social situation in the region, Hungary is ready to enter its troops into the territory of Transcarpathia to stabilize the situation and protect its citizens. It seems that the history of 1939, when Hungary introduced its troops in Transcarpathia, could be repeated in Transcarpathia in order to counter the Galician extremism’. Such information is confirmed from the EU countries. As an officer of a European PMC said on condition of anonymity, ‘Shortly before the new year (around mid-December 2016), a private military company received a very large order and immediately moved almost in full force to Hungary, in areas bordering Ukrainian Transcarpathia’. Their PMC was tasked, in the event of a new Maidan or a civil strife in Ukraine, to immediately enter the territory of Transcarpathia to protect the citizens of the European Union. The military were already given maps of Transcarpathia with specific instructions on where and when to advance, and which localities, bridges and crossroads to seize. The focus is on the lightning speed, coherence and clear coordination with the Rusyns. In Transcarpathia, there are coordinators – people who are supposed to provide the maximum assistance from the other (Ukrainian) side, if necessary – who will bring the PMC personnel in by smugglers’ trails to the place of a new deployment, and then provide them with cover and supply. The Hungarian frontier guards and special services, for their part, will not obstruct the mercenaries involved in this operation. ‘If the forces of the Armed Forces are brought against Uzhhorod,in this case (which is also being considered), the Hungarian government is even ready to introduce, in response, into the army and special forces the neighboring territory. Strictly within the legal framework, in order to protect the lives of its citizens, of whom several hundred thousand people live in this western region of Ukraine. Thus, the issue with the exit of Transcarpathia (and other western regions of the country) from Ukraine has already been solved – behind the scenes, but at the highest level: at the level of the governments of the EU countries, special services and European elites. And how this will be legally formalized – either as the direct entry of Transcarpathia into Hungary, the confederation with the Magyar neighbors or the implementation of some “Abkhazian” scenario – is already a less important question. That is, there is a model of the collapse of Ukraine, from the periphery to the center. What we can see is the Crimea, Donbass, Transcarpathia. Further, it is Kharkov and Lvov, and so on. Then the country is cut off from the sea and ports, and Russia goes to Transnistria. That is, the failed state is deprived of the most remote territories which, very quickly by historical measures, enter the fields of gravity of other political and state entities. Thus, the window of opportunities in Ukraine has narrowed to such a level that it practically does not exist, as Ukraine can not either return Donbass or cut it off. In one case, a civil war will lead to economic strangulation of the state, in the other, to its territorial disintegration. Therefore, the current alignment of forces in Kiev, the games of everyone with everyone, do not have any relation to the real political process of governing the country. Clans have got engaged into their games so deeply that they see only commercial interests of each other, while the interests of the country do not exist for them any longer – they are fighting only for that piece of pie that they can hold, but this is already a losing strategy. Western publications also write about this,‘The German government has declared that it does not understand the actions of Ukraine and ‘in an unprecedented form’ warned Kiev against the collapse of the country. There are quoted the words by the representative of the Foreign Ministry of the Federal Republic of Germany, Martin Schaefer, who noted ‘continuing trends towards a split in Ukraine’. The Associated Press points to the ‘sharp turn’ of Poroshenko who tried to first stop the blockade, and now he has himself introduced it. The agency notes ‘the vulnerability of the Ukrainian government to the radical forces’, it is noted that it is the nationalists who increasingly influence the political course of the country’. Thus, the Ukrainian junta, having come to power on bayonets of radicals, has not managed to restore the monopoly on violence. As a result, the radicals have been getting stronger every month, and today the power can not stop them any more, since it does not have the necessary authority, while the army, seeing what is happening at the top, is most likely to follow the radicals, as the only force that can establish the order in the country. This is also evidenced by the recent unification of the ‘Svoboda (Freedom) party, The Right Sector (an organization whose activities are banned in Russia) and the party National Corps created on the basis of the Azov nationalist battalion. That is, most likely, the territorial disintegration of the country will occur simultaneously with Kiev’s loss of its capital functions and the collapse of the state power at all levels. That is not a very good scenario for Moscow, since it would be better for the process to go more gradually and for Russia to have time to digest and build the incoming territories into a single mechanism. Therefore, the more fierce is the war of the junta clans for the already phantom power in Kiev, the faster our “squirrels” roll the yellow-and-blue wheel of the Ukrainian statehood to the cliff.